The European Hospital and Healthcare Employers’ Association (HOSPEEM) and the European Federation of Public Service Unions (EPSU) organised the first regional seminar to promote and support the implementation of Directive 2010/32/EU on the prevention of sharps injuries in the hospital and health care sector. This project is funded by the European Commission. The seminar took place on 31 January in Dublin and was hosted by the Health Service Executive (HSE) representing the Irish health employers and IMPACT, the Irish Trade Union. The seminar was attended by 90 representatives of employers, employees, national authorities and other stakeholders from 10 countries. During the seminar a presentation by ICF GHK was made to outline the first result of the survey on the progress so far in the implementation of the directive. There were also presentations about the transposition of the directive in Finland, Ireland, the Netherlands, Sweden and the United Kingdom from practitioners and academia representatives. The speakers underlined the importance of continued work on the issue, investment in protective safety equipment, better training and reporting, and the role social partners should play at local, national and European level to prevent sharps injuries. The presentations were followed by working groups who discussed how best to implement the directive. The groups comprised of employers and employees’ representatives from Belgium, Denmark, Finland, Iceland, Ireland, Latvia, Lithuania, the Netherlands, Sweden and the United Kingdom. The findings gathered at the seminar will be published in the event report in mid-February on the webpage devoted to the project. Further seminars in the framework of the project will take place on 7 March in Rome and on 16 April in Vienna. The final conference will be held on 20 June in Barcelona. HOSPEEM is the European Hospital and Healthcare Employers Association. It regroups at European level national , regional and local employers’ associations operating in the hospital and health care sector and delivering services of general interest, in order to co-ordinate their views and actions with regard to a sector and a market in constant evolution. HOSPEEM is an individual member of CEEP. EPSU is the European Federation of Public Service Unions and the second largest federation of the ETUC, with 8 million public service workers from over 200 trade unions in 45 countries. They organise workers in the energy, water and waste sectors, health and social services and local and national administration. In health and social services EPSU members affiliate about 3.5 million workers. Tjitte Alkema was elected Secretary General of HOSPEEM for a three-year mandate period, starting as of 1 January 2013. Mr Alkema has been involved in HOSPEEM’s activities since 2008 as a member of General Assembly on behalf of NVZ Dutch Association of Hospitals. In 2010 he was elected for the Vice Secretary General position at HOSPEEM which he fulfilled until the end of 2012. At national level Mr Alkema works as the Manager of Industrial Relations & Education at NVZ Dutch Association of Hospitals, Chairman of the Foundation of Hospital labour market activities (StAZ), and Chairman of the consultative body on collective bargaining in the Dutch Hospital sector on behalf of NVZ Dutch Association of Hospitals (ROZ). Before that he worked at several managerial positions in a Dutch trade union association. Ulrike Neuhauser (Austrian Hospital and Health Services Platform) and Elvira Gentile (ARAN, Agenzia per la Rappresentanza Negoziale delle Pubbliche Amministrazioni) were appointed Vice Secretaries General of HOSPEEM. This framework constitutes an important basis for social partners at European and national levels to develop concrete action to tackle staff shortages and qualification needs now and in the future. “Our framework shows that social partners can produce practical results that will improve health care delivery in the interest of patients, health care providers and workers. To have the right workforce planning mechanisms in place is key from an employers’ perspective in the health and hospital sector. Innovative workplace designs can be supported by ICT-instruments, actively involving the healthcare workforce and their representatives.” says Godfrey Perera, HOSPEEM Secretary General. The social partners have agreed to develop joint model initiatives, supported also by the collection of case studies and good practice. They also committed themselves to jointly monitor relevant European legislation and policies and to embark on follow-up action on the implementation of the Code of Conduct on Ethical Cross-border Recruitment and Retention in the Hospital Sector. (Riga) – “The involvement of health care sector NGO’s in the decision making of high importance issues gives an opportunity for eventually best problem solutions. Therefore the proposals and warnings from professionals should be taken into account in the development process of next year’s budget. In my opinion, the health care budget should not be subject for further decrease and taking into account all the financial possibilities in future the health care budget should make 4% of the GDP in order to stabilize the health care sector”, said the Minister for Health of the Republic of Latvia Didzis Gavars in the meeting with Godfrey Perera, Secretary General of the European hospital and healthcare employers’ association and Jevgenijs Kalejs, the Chair of Latvian Hospital Association. During the meeting there were discussions on the situation in the field of health care in Latvia and as well as in the European Union. The Minister for Health of the Republic of Latvia emphasized that there should be further actions taken in order to increase the efficiency of the health care sector by developing out-patient care. As well as during the meeting there was stressed the need for continuing the work together with social partners on the development of National Human resources program, that would in a long term grant access to health care services from highly qualified health care professionals. During the meeting the implementation of the not yet adopted proposal for a Directive on the application of patients’ rights in cross-border healthcare was pointed out as one of the main challenges on the European Union level. Eight European organisations of social partners have today adopted joint Guidelines setting out the practical steps that can be taken by employers, workers and trade unions to tackle problems of thirdparty violence in a range of different service sectors. The guidelines have been agreed by CEMR, CoESS, EFEE, EPSU, ETUCE, EuroCommerce, HOSPEEM and UNI Europa, all sectors which face the challenge of violence originating from members of the public. The European Working Conditions Survey shows that almost one in ten workers in the EU report having suffered violence, bullying or harassment at work in the previous year (results 2005 survey). According to the survey, carried out by the European Foundation for the Improvement of Living and Working Conditions, third party violence at the hands of clients, customers or patients is more common than violence from work colleagues. Threats of violence and actual violence from third parties are most common in a variety of sectors. The eight sectors are increasingly concerned about the impact of such violence since it not only undermines the health and dignity of individual workers, but also has a very real economic impact in terms of absences from the workplace, morale and staff turnover. – Demonstrate the commitment of social partners to working together and sharing experiences and good practice to help prevent and manage problems of harassment and/or violence instigated by third parties and reduce the impact on employees’ health and well-being, sickness absence and productivity. – Provide employers, workers and their representatives at all levels with Guidelines to identify, prevent manage and tackle problems of work related harassment and violence instigated by third parties. The Guidelines complement the cross-sectoral agreement on violence and harassment at work, adopted in 20074. CEMR, CoESS, EFEE, EPSU, ETUCE, EuroCommerce, HOSPEEM and UNI Europa will work together to implement the Guidelines in all member states. The European Hospital and Healthcare Sector Social Partners – The European Federation of Public Service Unions (EPSU) and the European Hospital and Healthcare Employers’ Association (HOSPEEM) welcomed the decision of the Council which adopted the directive on prevention from sharp injuries in the hospital and healthcare sector today. 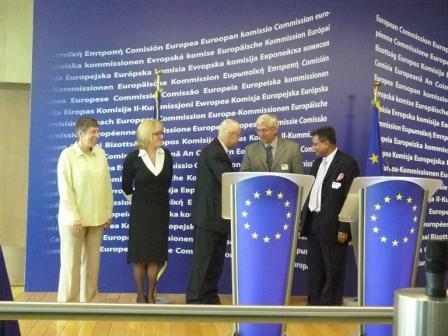 The agreement between the European Social Partners in the hospital and healthcare sector signed on 17 July 2009 has become law. Now the European Member States have three years to implement the requirements set out by the directive. EPSU is the European Federation of Public Service Unions. It is the largest federation of the ETUC. 8 million public service workers from over 200 trade unions are members. They organise workers in the energy, water and waste sectors, health and social services and local and national administration. The European Hospital and Healthcare Employers’ Association (HOSPEEM) and the European Public Services Union (EPSU) today signed an EU-wide agreement to prevent injuries from needlesticks and other sharp objects. The Joint Framework Agreement was concluded after five months of negotiations by the European social partner organisations in the sector, which employs around 3.5 million people. In 2006, the European Parliament adopted a resolution requesting the Commission to submit a legislative proposal on protecting healthcare workers from blood-borne infections due to needle stick injuries. After the two-stage consultations on this issue, in 2006 and 2007, the EU social partners decided to organise a technical seminar with all stakeholders (nurses, doctors, surgeons and so on), which highlighted the many causes of injuries in hospitals and healthcare services. In December 2008, they informed the Commission of their intention to negotiate on a wider basis covering all types of sharp injuries (including needle sticks). The negotiations, to which the commission provided technical and logistical support, started in January 2009 and were completed on 2 June 2009. – set up an integrated approach to assessing and preventing risks as well as to training and informing workers. At the request of the European social partners and after having examined their representativeness and the legal conformity of the text, the Commission intends to submit, after the summer, a proposal to the Council for implementation of the agreement by a directive, in accordance with article 139 of the Treaty. The agreement specifically addresses one of the priority objectives of the EU’s current strategy for health and safety at work (2007-2012). “We cannot let market forces run healthcare systems or we will end up with a two-tier system of healthcare delivery” said Godfrey Perera, General Secretary, European Hospital and Healthcare Employers association (HOSPEEM). The Hospital sector employers and trade unions in Europe today joined forces to send a message to EU Health Ministers. The Social Partners for the sector were speaking on the draft EU directive on cross-border healthcare which is being discussed by EU Health Ministers in Luxembourg today. The European Federation of Public Service Unions (EPSU), represented by Karen Jennings (UNISON, UK) and the European Hospital and Healthcare Employers association (HOSPEEM), represented by Mr. Perera sent the joint message to the EU Health Ministers before 600 public service trade unionists at the EPSU Congress in Brussels. They urged the EU Ministers to base the directive on a joint legal basis of public health and the internal market. The joint basis would have allowed Member States to ensure that all citizens have equal rights to high quality healthcare based on medical need, and not just the ability to pay their travel, accommodation and other costs. “The EU Ministers, meeting today, have a chance to put this health debate back on the right track, by recognizing that the universal principles of healthcare solidarity are the starting point and not the internal market”. “To guard the principle of healthcare systems based on solidiarity, national healthcare systems must have the right to organise those systems – to do this, they need proper prior authorisation abilities”. The issue of allowing Member State to give prior authorisation to patients, who wish to travel, remains a major issue, as is the need to consider the subject of rare diseases under separate legislations. 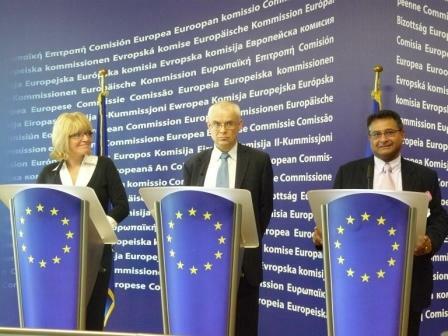 The EU Health Ministers are expected to conclude discussions tomorrow, 10 June. On Monday 14 July a joint Hospital Social Partner delegation met Commissioner Vassiliou. Importantly, Commissioner Vassiliou agreed on the need to develop structured cooperation with the Hospital Social Partners in the future. DG SANCO intends to publish a Green paper on health workforce, in December 2008. The European-wide lack of qualified health professionals and the migration of health care professionals within and across the European Union borders require a common policy at European level. The starting point for an had hoc input of the social partners to the ongoing Commission work will be the Code of Conduct and follow up on Ethical Cross-Border Recruitment and Retention in the Hospital Sector, signed in April 2007. The text deals with many of the aspects the Commission is intending to tackle, such as strategies to promote ethical cross border recruitment and to prevent acute staff shortages in the so called “donating countries”. The meeting of the Health Commissioner with the EPSU and HOSPEEM leadership marks a significant step in the relations between the European Commission and European Social Partners in the hospital sector. The European Federation of Public Service Unions (EPSU) and the European Hospital and Healthcare Employers’ Association (HOSPEEM) today met jointly in the first formal meeting of a European Sectoral Social Dialogue committee for the hospital sector. The establishment of the committee represents the first occasion that there will be formal recognition of social partners in the hospital sector at the European level. This is an extremely significant step as it allows the workers and employers to have a direct formal input on EU polices affecting the hospital sector. Over the last 5 years, as the social partners for the hospital sector at European level, EPSU and HOSPEEM have been working, with European Commission support, to formalise sectoral social dialogue at the European level. The successful agreement to establish a committee marks the end of the ’informal stage’ and the beginning of genuine social partner engagement at the European level for the sector. The social dialogue process is supported by the Directorate General for Employment and Social Affairs of the European Commission. The formal committee will consists of trade union and employer representatives from all over the 25 EU Member States. The new skill requirements for the workforce in the sector. These items will be linked to items, which are high on the political agenda. If you want to arrange interviews with EPSU or HOSPEEM leadership or with delegations from one of the countries, please call EPSU press officer Brian Synnott,+32 474 98 96 75 or HOSPEEM secretariat, +32-2-2292157. HOSPEEM is the European Hospital and Healthcare Employers Association. It regroups at European level national employers’ associations operating in the hospital and health care sector and delivering services of general interest, in order to co-ordinate their views and actions with regard to a sector and a market in constant evolution. HOSPEEM is an individual member of CEEP.